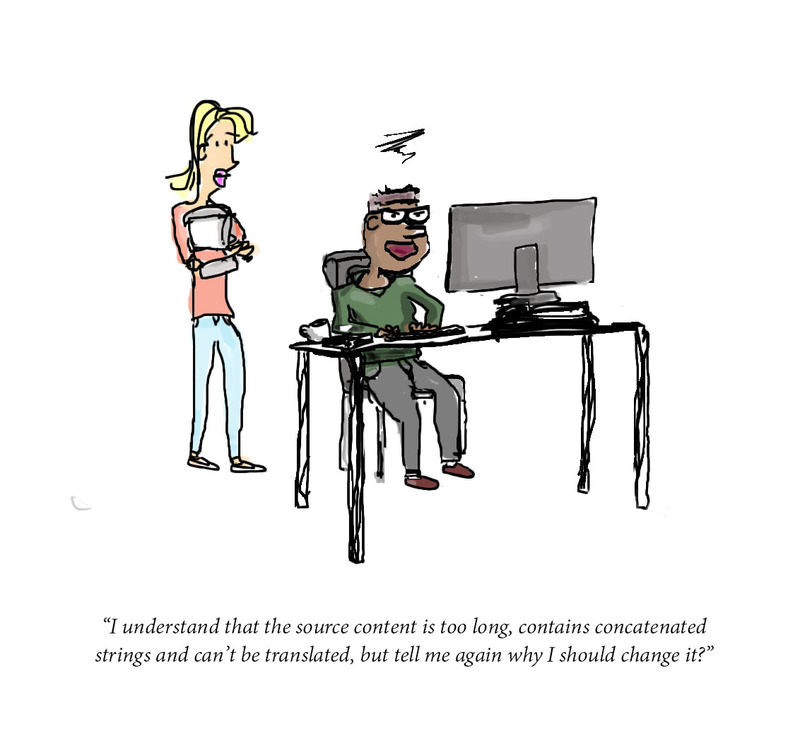 If you’ve ever been involved in translating or localizing a product, you know how tedious and stressful the entire process can turn out to be - from file formatting and internationalization nightmares to unexpected updates, design bugs and incorrect or missing translations. Applanga was developed specifically to address pain points traditionally encountered in the localization process that other localization tools tend not to address. As a result, the tool has been embraced by large corporations, startups, partner LSPs, and individuals who discovered that automated, independent localization process is no longer a myth, but a reality. Let’s face it – localization is too often thought of as an afterthought, a necessary evil that must take place after the “real” work is done by developers who create the product. In turn, localizers must constantly work hard to remind (and educate) their developer coworkers the importance of their work, their employees, the bugs they report and their budget. A huge downfall to the general lack of efficient communication between developers and localizers is that content can be updated unbeknownst to the localization team, sometimes even just a couple days before deadline. Not only does this result in tremendous stress placed on everyone involved, but also requires everyone to drop what they were currently working on and switch their efforts to the surprise update. Once Applanga’s SDKs are integrated with your app, strings are automatically synced and viewable on the Applanga dashboard. Project managers and translators are never in the dark because they see the untranslated strings as soon as they are inserted into the app’s code. No more surprise updates that pass unnoticed until the last second. All translations complete, but your problems are only beginning. The translation process is typically the easy part, while the linguistic quality assurance (LQA) process following translation is actually the time-consuming, stress-inducing culprit. Having to juggle and relay messages back and forth between testers, managers and engineers, is a full-time job in itself. Then, in order for testers to finally see the changes they submitted, a new build must be created with those changes integrated before another round of LQA. This requires all parties involved to spend more and more time on communicating and waiting on others. Imagine having the power to change the text within your app and then see those changes in front of you in your hand within seconds. No developers. No waiting. Applanga takes any hassle out of the equation during LQA. Engineers are able to focus at their current tasks at hand without having to put their workload on hold while creating new builds for localization testing. Localization PMs and testers don’t need to wait around while those builds are created. It’s a complete win-win. Because the Applanga SDK bypasses app stores and user updates, you can alter your translations and localized content in the Applanga Dashboard and the after restarting the app, see those changes instantly. Not sure if you want to push a translation live? Applanga comes complete with a “Draft Mode” that enables localizers to get a feel how freshly localized content would look within the app before letting end-users see it. Implementing Applanga does not mean reworking your entire localization process and should be used only where needed. Clients using Applanga vary in size and degree of localization maturity; in addition, a range of TMS and CAT tools as well as other unique internal processes are often already in place. Applanga's users may choose to integrate the tool for their entire localization process, while others really only like the idea of in-app testing. That being said, no matter how your team does localization, Applanga can be fitted and implemented to any workflow to alleviate pain points. The ability to update, test and manage localized strings independently from the development cycle enables both localizers and engineers to focus on what they love doing. Eliminate pain points and free up bottlenecks by giving localizers more power to efficiently do their job without distracting from development schedules. Furthermore, Applanga’s intuitive UI combines the best features of other localization tools and improves upon them, including: inline editing, roles permissions, change logs, live draft translation testing, with much more on the way. Less roadblocks, less errors in communication, more efficiency, more localizing.